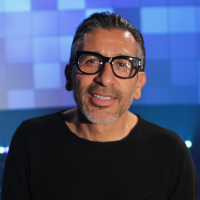 Southern California born and raised, Pastor Eddie Elguera holds the record of two-time World Champion and Skateboarder and Hall of Famer. These titles have opened doors to minister to tens of thousands around the globe. Pastor Eddie has been a part of The Rock Church family since its inception in 1988. He came on staff as an Associate Pastor in 1992. During that time he grew the youth ministry to nearly 1,000 teenagers weekly, led the Men's Ministry, taught for the adult congregation, and was a The Rock School of Ministry instructor. March 2006, Eddie and his wife were launched into a new adventure of planting The Rock Church in the Palm Springs area. His passion for souls and commitment to reach the lost and hurting has catapulted him into creating an enduring legacy that will impact the world around him as he continues Building Lives and Building Leaders. Along with being a full-time pastor, Eddie is a widely respected and sought-after speaker. He continues to travel the globe impacting lives and seeing thousands saved through his dynamic approach to teaching which is marked by his visionary and leadership qualities and his passion to see people reach their full potential and know the full love of God in their lives. Eddie has been married to his wife, Dawna, for 34 years and is the proud father of three sons, and two precious grandchildren.